In order to acquire a better understanding of the distribution, content and appearance of prehistoric cultures in Alxa League, Inner Mongolia, the Alxa League Museum has conducted a systematic field investigation across the whole league jointly with School of Archaeology and Museology of Beijing University in mid-July 2011. The result provides new materials for in-depth researches on local prehistoric cultures, and fulfills some gaps of the cultural sequences in western Inner Mongolia. Firstly previous found prehistoric sites within the Banner have been reviewed and positioned with GPS, and six sites including Lujuanshan, Toudaoshazi, Suhongtu I -VI have been confirmed. 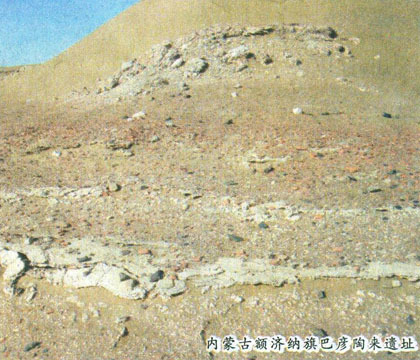 The Lujuanshan site, located 0.5 km southwest of the Banner, was found in 1950s and 1960s during capital construction. At that time a pit has been found containing a batch of ceramics from the Qijia cultural period, which are presently preserved in the Alxa League Museum. During this revisit only a broken stone knife with single perforation is collected. The Toudaoshazi site is located at ca. 7.5 km northwest of Bayan Hot in Alxa League, a place on the east edge of the Tengger Desert, hence its name. It was found in 1999. During 2002-2003 Alxa League Museum has conducted three surveys and collected a great deal of stone tools and ceramics. This time the precise location of the site has been oriented and some artifacts are collected. According distributing of artifacts on the surface the sphere of the site is defined with a wide area measuring 2 km long from south to north and 0.5 km wide. The ceramics collected are mostly sandy wares, with the fine-sandy wares accounting for the largest number and coarse-sandy wares second. The ceramic colors are mainly reddish or reddish-brown, also include gray or gray brown and rare black. There are a large variety of complicated decorations such as basket pattern, cord pattern, attached design and incised pattern. Among them the rectangular pressed pattern and triangular incised pattern are characteristics of the locality. The collected stone tools are mainly chipped flakes and cores and the secondary processed tools are rare. Some stone querns and sticks are also collected. The Suhongtu site is located at Wulijisumu, ca. 360 km north of Alxa League. It was discovered in 2004 and has been systematically investigated. This time the site is positioned precisely and the findings are re-numbered in accordance with the order they appear (Position I to Position IV). The position I and II are located at the hillside and the alluvial land 3-4 km east of Suhongtu, with 1 km apart. The artifacts are mainly chipped stone tools and no ceramic is seen. The position III and IV are located at a Gobi ca. 10 km northwest of Suhongtu and to its north about 500 m away is a sandy land. Besides stone cores, flakes and blades, the Position IV yields well-preserved ceramic Li cooker, jars with a round bottom and bowls. There are very few of prehistoric remains in right Banner. According to the previous findings, some sites are rich in contents, including both ceramics and microlithic objects. Stone tools include cores, flakes and oblong blades from indirect percussion. Ceramics are mostly sandy wares, either in red or reddish brown, decorated with cord pattern, basket pattern, attached design and comb pattern. There are few painted pottery, adorned with geometric designs composed of parallel stripes and trellis pattern, resembling painted potteries found in Machang Culture in Gansu Corridor. Eared jars, li cooker and spindles could be seen. Microlithic sites have been found before in the Banner, whereas those with ceramics are in small number. This time a large-sized prehistoric site, the Bayantaolai site, is discovered, which is located in the innermost desert ca. 25 km east of Dalaihubu Township, with an elevation of about 915 m. Surrounded with high huge sand dunes, the site measures 250 m long from south to north and 80 m wide from east to west, covering an area of ca. 20,000㎡. Artifacts are scattered on the surface of a long belt, indicative of its rich content. Stone tools collected are classified into chipped tool and polished tools. The chipped stone tools include cores, flakes and well-processed triangular arrow heads. The polished stone tools include querns, sticks, knives with perforations and axes. Among them most stone knives are broken, with one or two perforations at the middle part, which are drilled from both sides. Although only ceramic pieces could be found due to serious corrosion from sand, they have a large variety including double-eared jars, single-eared jars, jars with a flared mouth and jars with a tall neck. Most of them are fine-sandy red wares, and then coarse-sandy wares. Those with a flat bottom are very common. Most objects have a plain surface, and some are decorated with parallel geometric designs like cord pattern, attached design and incised design. Painted potteries could also be seen, mostly in black and some painted inside. In addition, there are a few animal bones scattered on the ground, belonging to sheep or pigs. The preliminary observation shows that the cultural features of the site bear strong resemblance with that of Siba Culture in western Gansu Corridor, while its specific nature is waiting for further study.